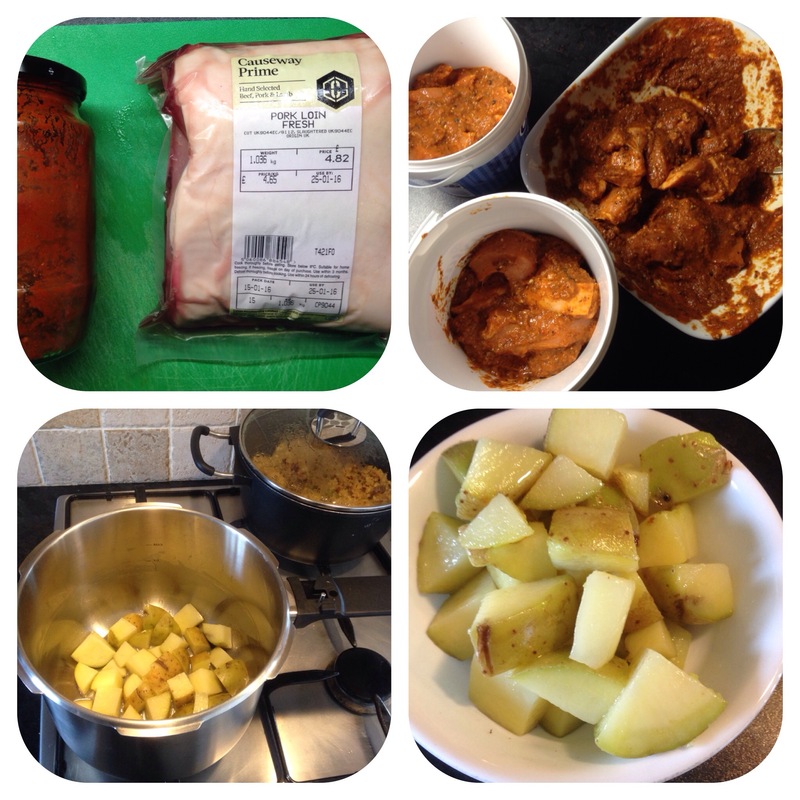 As promised the story of Vindaloo….. When the Portugese explorers arrived in Goa, India about 500 years ago, they brought with them the humble pig. The extreme heat of Goa spoiled the meat very quickly. So in order to preserve the meat (pig-vind) they added salt, Chillies and vinegar. 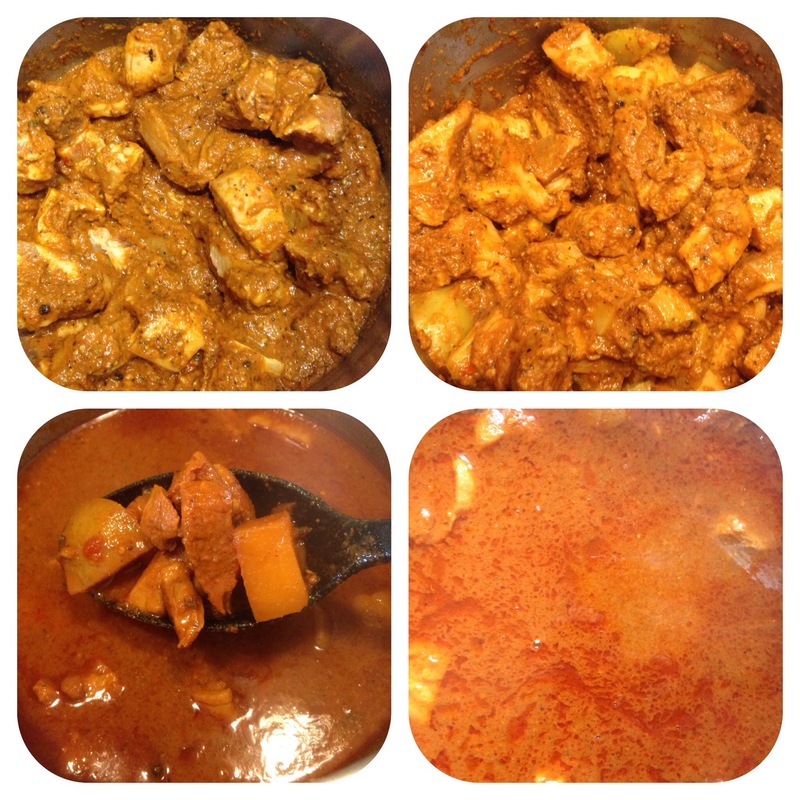 When they cooked the meat they did so with aromatics and potatoes (aloo) and that is the origin of the Vindaloo. Of course it can be made with chicken, lamb or fish as well as vegetables. I diced a kilo of assured origin Northern Irish pork loin (from Lynas Foodservice) on Monday night and marinaded this in a mixture of fresh red Chillies (10), 1 tablespoon chilli powder and paprika, 2 teaspoons salt, 3 teaspoons black peppercorns, 6 cloves garlic, 1 inch ginger, 2 diced onions and 300ml of vinegar. The mixture was puréed before coating the meat. The marinaded meat was refrigerated until today when I cooked it. In a pressure cooker I added a tablespoon of coconut oil and fried 2 diced potatoes. I removed these and put the meat into the pot and cooked for 10 minutes, then added a can of plum tomatoes, the potatoes and a pint of water. I brought this to the boil, put the lid on and cooked for 20 minutes. The resulting vindaloo was pretty hot, meat was so succulent and it smelled and tasted amazing.